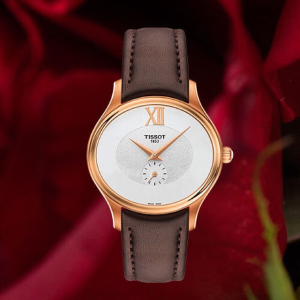 JomaShop.com offers the lowest price extra $55 off TISSOT Bella Ora Ladies Dress Watches for $169.99/ea via coupon code DMTS55 . Features: Rose gold PVD stainless steel case with a leather strap. Fixed rose gold PVD bezel. Rose gold-tone hands. ETA caliber 980.153 quartz movement. Scratch resistant sapphire crystal. Case dimensions: 31.4 mm x 28 mm. Case thickness: 6.58 mm. Oval case shape. Water resistant at 30 meters / 100 feet.